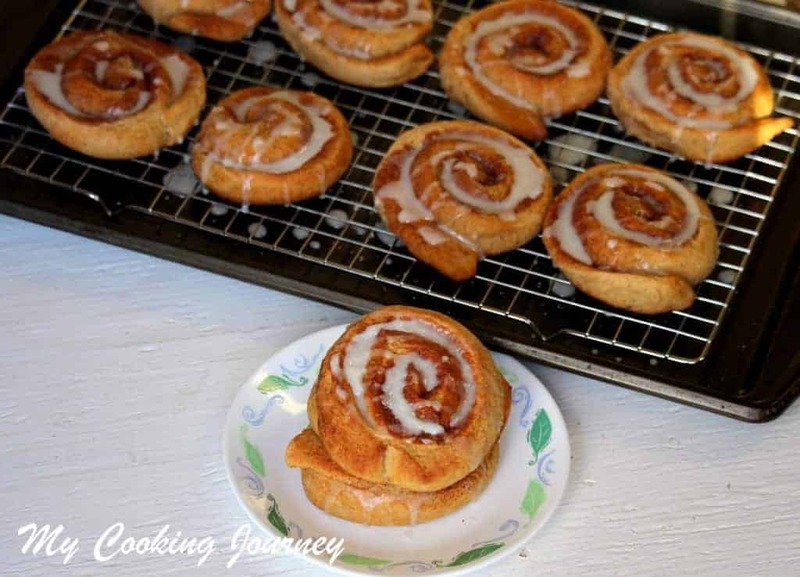 Making that perfect bun using whole wheat flour is a baker’s dream. It had been my wish to make one for a while since I saw the recipe on Peter Reinhart’s whole grain breads baking book. When this theme was announced, I had made up my mind to try this recipe. 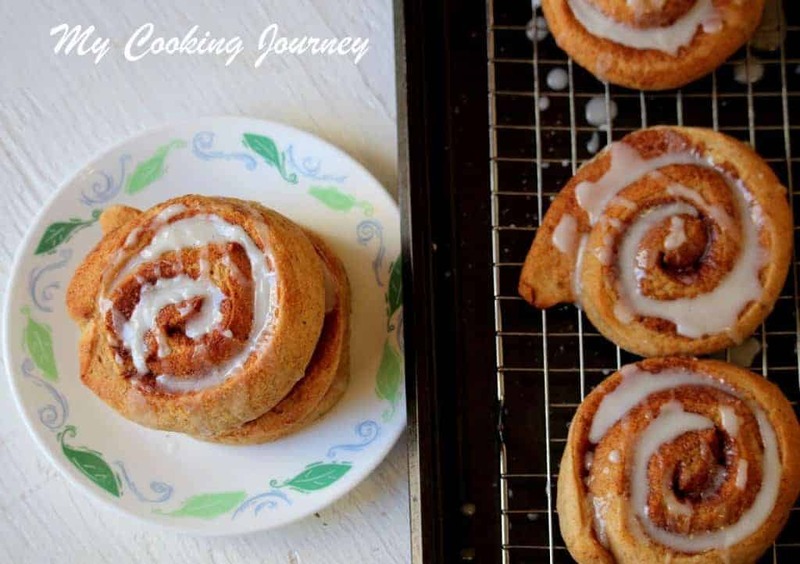 I have made the Swedish Cinnamon rolls before and the kids really enjoyed it as much as I enjoyed shaping them. 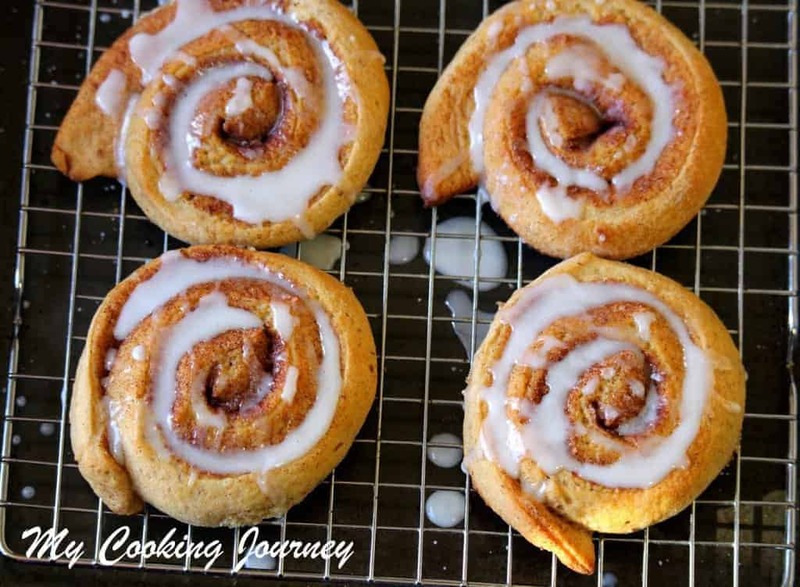 This is a straight forward cinnamon bun made with whole wheat flour.The process for making these buns takes 2 days. The first day is just getting the soaker and the biga ready. Day 2 is actually when you will be doing all the kneading and proofing. I have tried my best to explain the procedure with pictures. Let me forewarn you even before you go deep into the recipe. 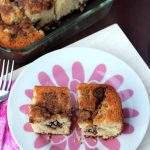 Do not expect the texture to be like the regular cinnamon buns made with all purpose flour or bread flour. The texture of this is definitely different and it takes a bit of getting used to. I personally love the earthiness quality of the whole wheat flour where as my husband is not so fond of it. He still managed to empty the container, so that proves that it was just a matter of getting used to the texture. 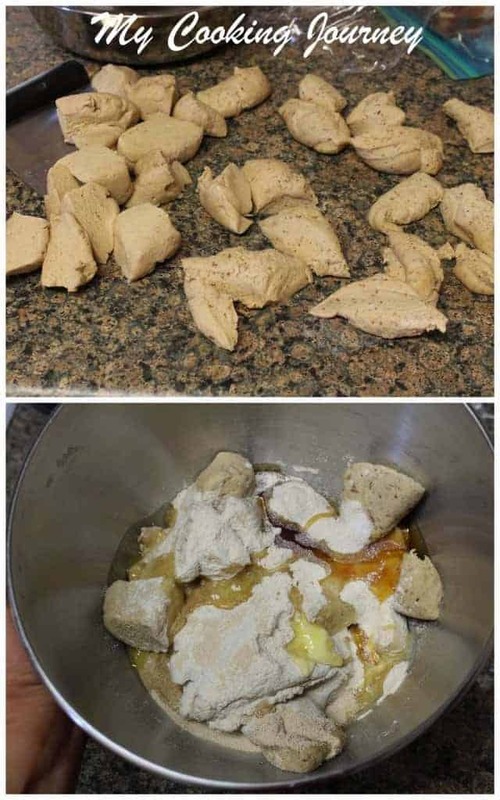 I have followed the recipe exactly as in the book as I do not like to mess around when trying to bake a recipe with whole grains for the first time. The only change that I have made is replacing the egg with flaxseed meal. 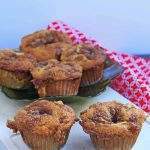 The recipe uses one egg in the soaker which I have replaced with flaxseed meal. 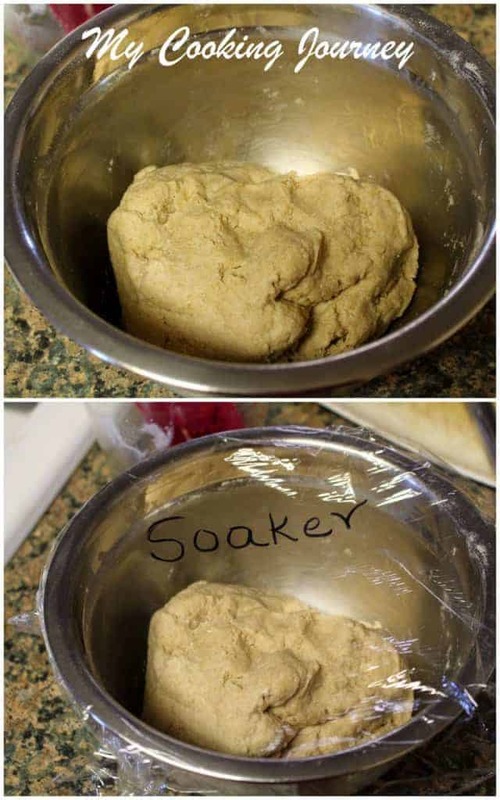 Mix all the soaker ingredients in a bowl until it forms rough dough. I used yogurt as my liquid, but you could use milk, buttermilk or soy milk instead. Cover with plastic wrap and leave it in room temperature for 12-24 hours. 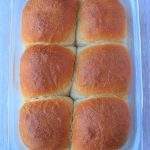 I made the buns the next day, so I kept my soaker in the refrigerator for about 30 hours. 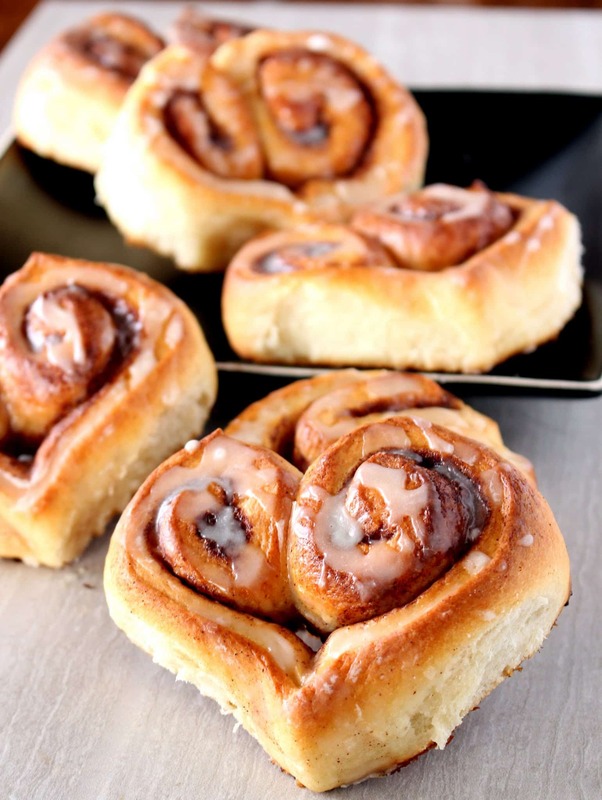 If you are planning on making the buns later like I did, leave the soaker in the refrigerator. It will stay good for up to 3 days. Remove it about 2 hours before making the final dough to bring it to room temperature. Mix all the ingredients mentioned for biga in a large bowl. Knead the dough for about 2 minutes to make sure all the ingredients are mixed well. Let the dough rest for 5 minutes and then knead again for a minute. 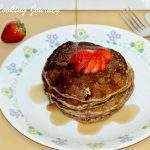 I used flax seed meal instead of egg. If you are fine using egg, then use it instead. 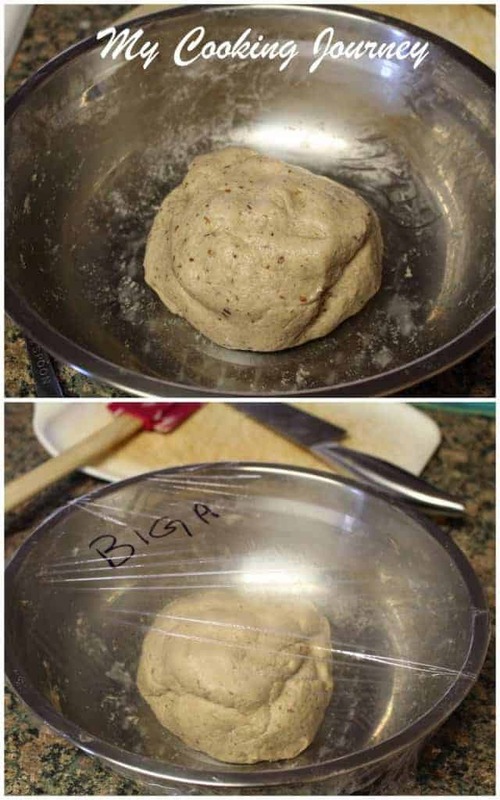 Cover the dough with plastic wrap and then refrigerate for at least 8 hours. This also can be left in the refrigerator for up to 3 days. Remove it from the refrigerator about 2 hours before making the final dough. The dough will rise slightly but not too much. Remove the soaker and Biga from the refrigerator at least 2 hours before making the final dough. Chop them into 12 pieces each. I used a stand mixer to make my final dough, so I placed the pieces of soaker, biga and the rest of the ingredients in the mixer bowl and mixed roughly using the paddle attachment. This allows all the ingredients to incorporate. Now change over to the hook attachment and knead for 3-4 minutes. The dough will be slightly sticky and tacky. Do not be tempted to add more flour. Scrape the sides of the bowl and then knead again 3-4 minutes. The dough would be very smooth but still tacky. Make sure that the dough has passed the windowpane test. 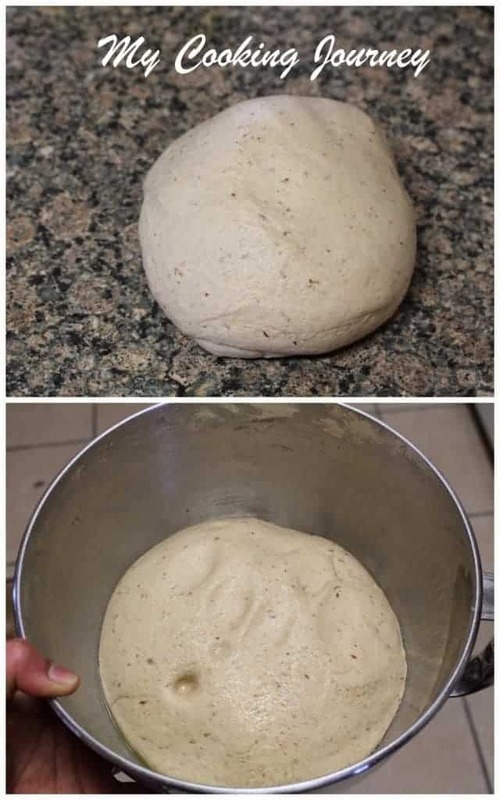 Form the dough into a ball and place it in an oiled bowl. Rotate the dough once to coat all the sides with oil. Cover loosely with plastic wrap and let it rise at room temperature for about an hour or until 1 ½ times the original size. It took me a little over an hour to get the rise. 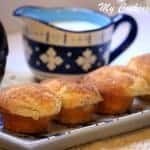 Mix the sugar and cinnamon powder in a bowl. 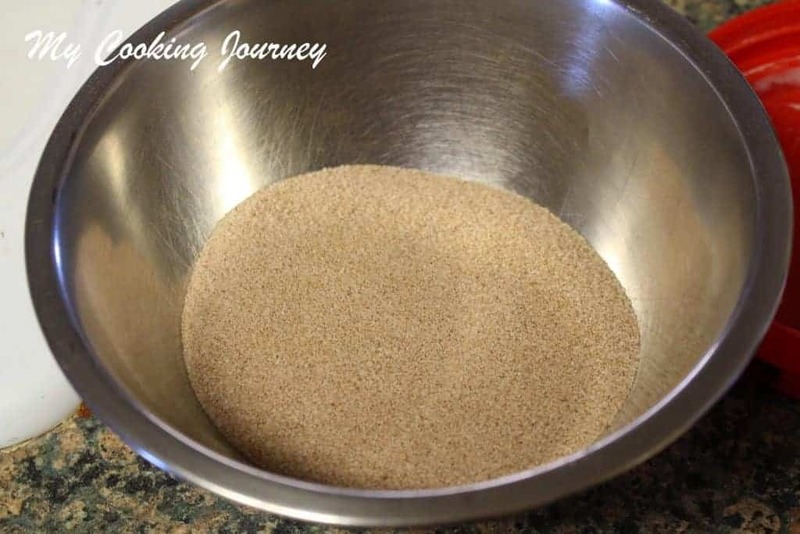 This will be the cinnamon sugar that goes into the buns. When the dough has risen, dust the work surface with some flour. 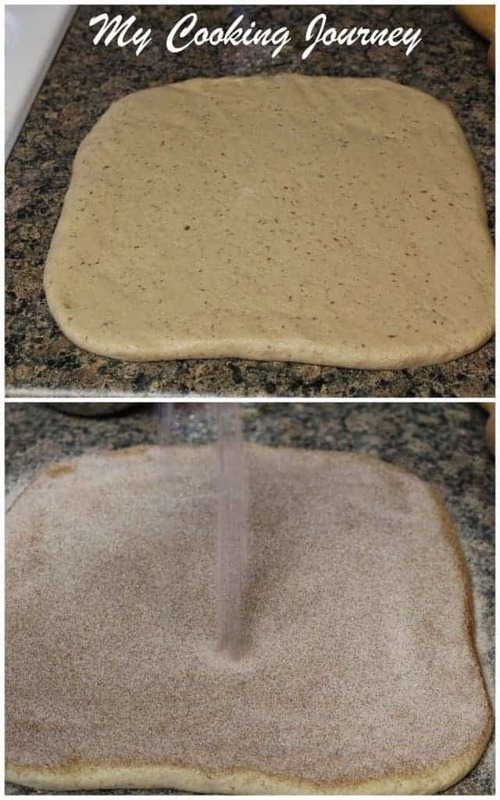 Transfer the dough to the floured surface. 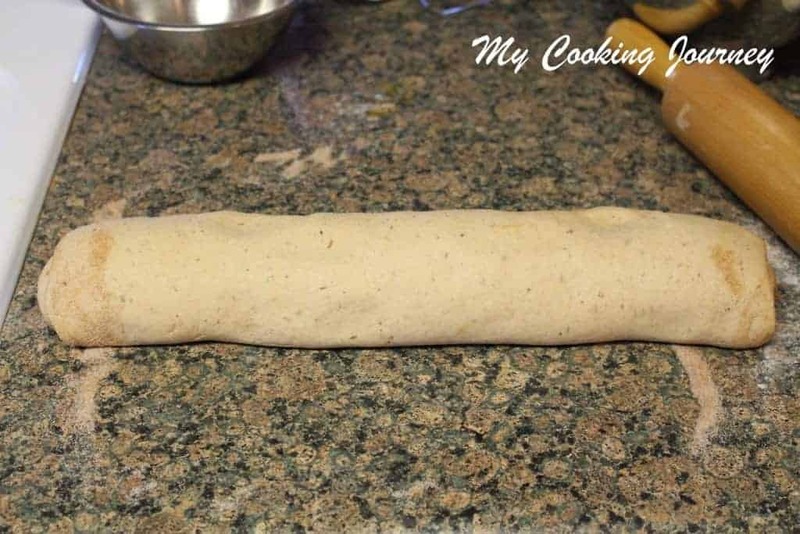 Roll the dough to 9 inch square. 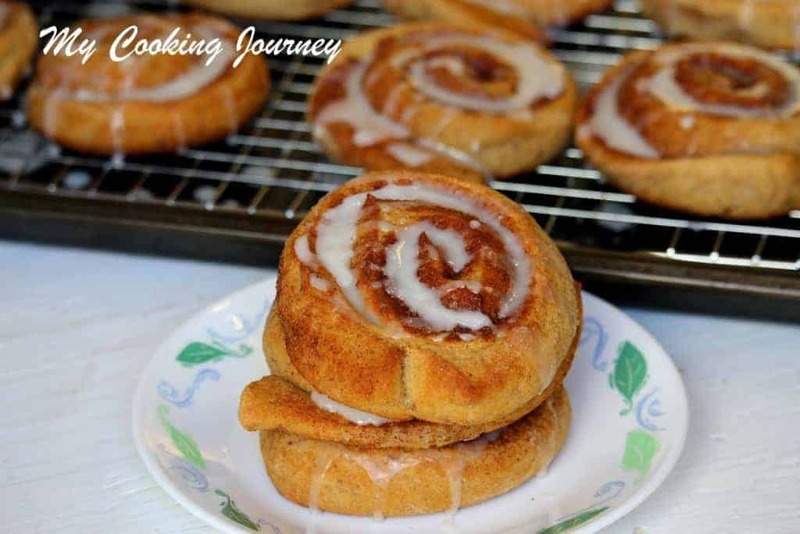 Sprinkle the prepared cinnamon sugar evenly over the rolled dough. 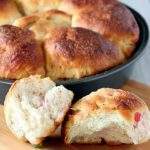 Roll the dough into a tight loaf. 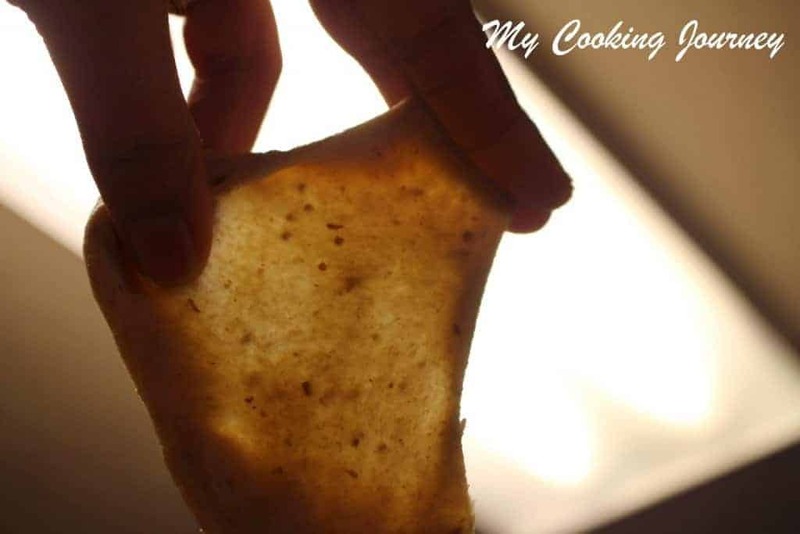 Slice the dough into 1 inch thick pieces and lay them on a parchment lined baking sheets. Lightly spray the top of the buns with an oil spray and then cover it with plastic wrap. Let it rise for about an hour until the buns are almost double in size. 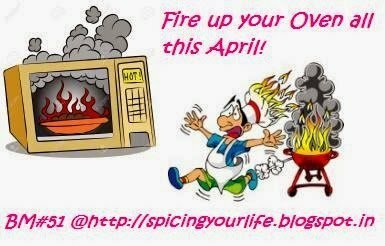 Preheat the oven to 400 F and then lower the temperature to 350. 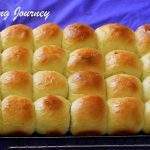 Bake the risen buns for about 15 minutes. 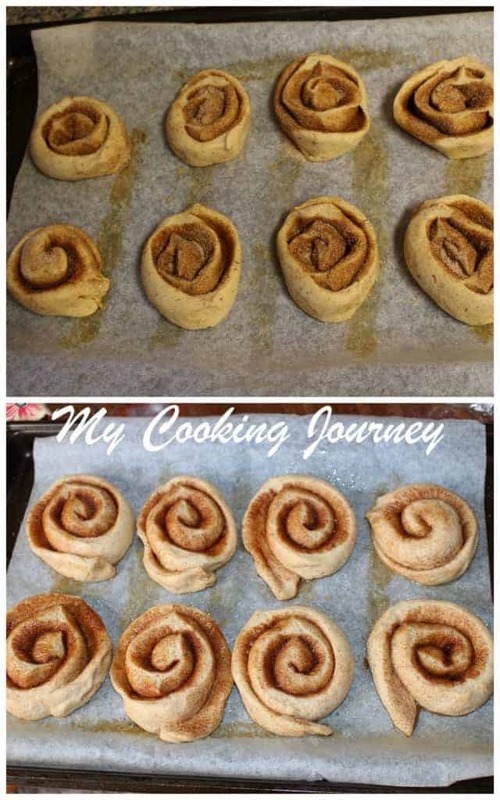 Rotate the pan in between and then bake again for 10 – 15 minutes. The buns will be rich brown when done. 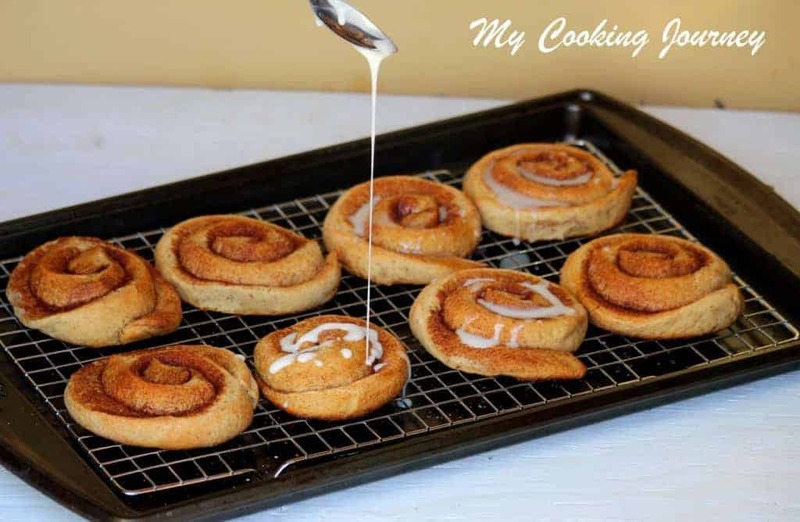 Remove the buns and let it cool for about 5 minutes in a rack before glazing them. 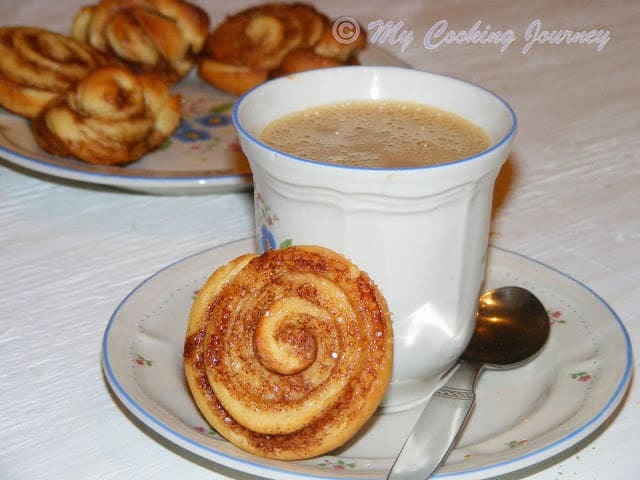 To make the glaze, combine all the ingredients mentioned above and mix well with a whisk. Make sure that there are no lumps. The glaze should be thick in texture. 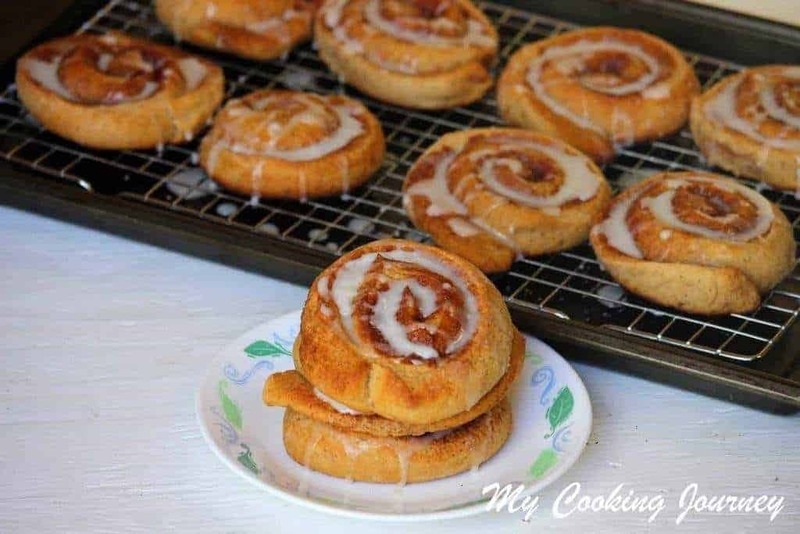 Once the buns have cooled for about 5 minutes, drizzle the glaze evenly.